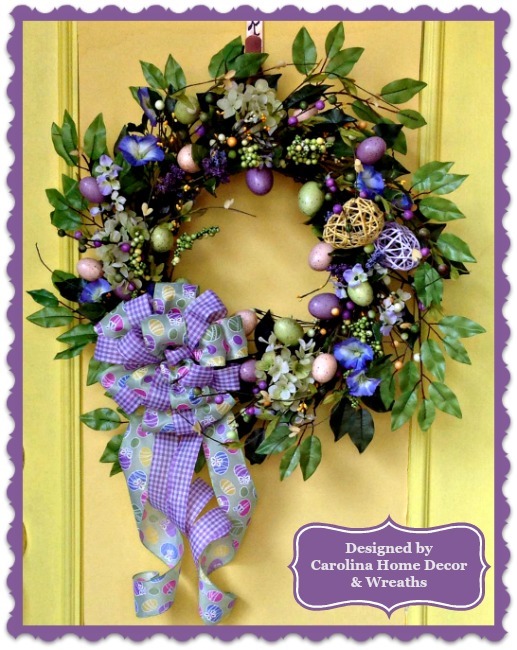 Beautiful 27" Easter Grape Vine Wreath decorated with various colors of Speckled Eggs (Size does not include Bow Tails). Variety of Greenery, Colored Balls, Pansies, Mums, and other Flowers make this wreath both colorful and pleasing to the eye. Yellow and Lavender Wired Eggs adds a unique Accent. Gorgeous Double Bow with Tails features a Spring Green Ribbon with a Colorful Egg Pattern and Lavender Gingham. The Combination of the contrasting Ribbons make it stand out! Ribbon is wired for easy reshaping. This wreath has been sprayed with a Protectant for Outdoor Use. Only 1 Available in these gorgeous colors. May be used for Easter and throughout Spring!